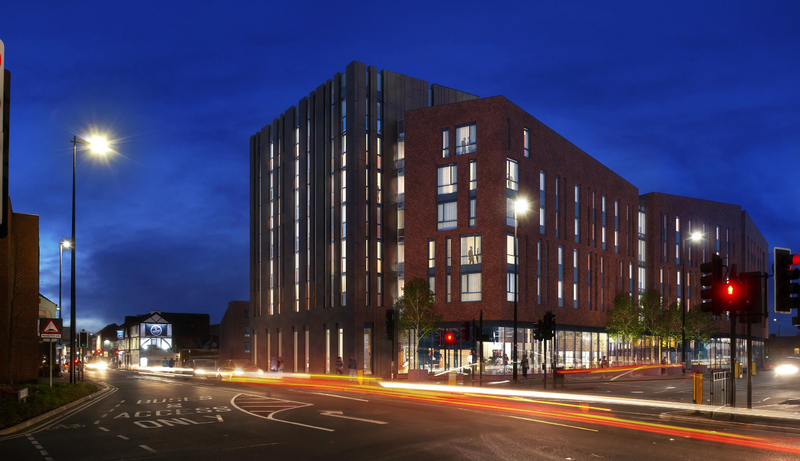 The redevelopment of the Aumberry Gap site in Loughborough involves the provision of 440 student beds for Future Generation. Refreshingly, as part of the brief, Future Generation included a genuine intent to involve the community in the emerging form of the development. As such, active ground floor uses not only involved student accommodation services and communal space, but also space dedicated for community use. The development of the design follows principles of scale and form established in Charnwood Borough Council’s Town Centre Masterplan with perimeter blocks enclosing a courtyard space. The design draws on a rich tradition of brick manufacturing in the Leicester area with the folded form of the perimeter block being sculptured in brickwork. This perimeter block development is situated on a gateway site into Loughborough Town Centre. It is bounded in close proximity by two conservation areas with listed buildings opposite one side of the site. The design of the perimeter form sweeps up in height from 3 storeys opposite the listed cottages up to a constant 5 storeys to align with the town’s masterplan with a taller element of 7 storeys on the corner where two major thoroughfares meet. This corner element is distinguished from the remainder of the development by a tonally similar but texturally contrasting material. The rhythm of the windows is one of playfulness giving a vibrancy to the streetscape with deep reveals adding to the play of light and shadow across the façade. The typology of student accommodation changes across the site becoming townhouse accommodation opposite the listed cottages to reflect not only the domestic scale of this street but also the activity of the street by providing individual front doors. Two internal courtyards are separated by an internal block of accommodation. 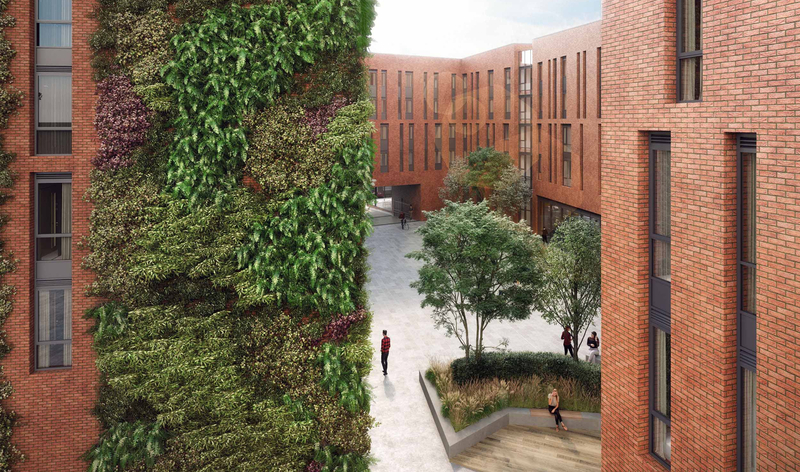 These courtyards provide a shared pedestrian/vehicular courtyard and a landscaped external social space for students. The main entrance is centrally located allowing for a central reception serving the two ground floor uses of student amenity and community spaces.